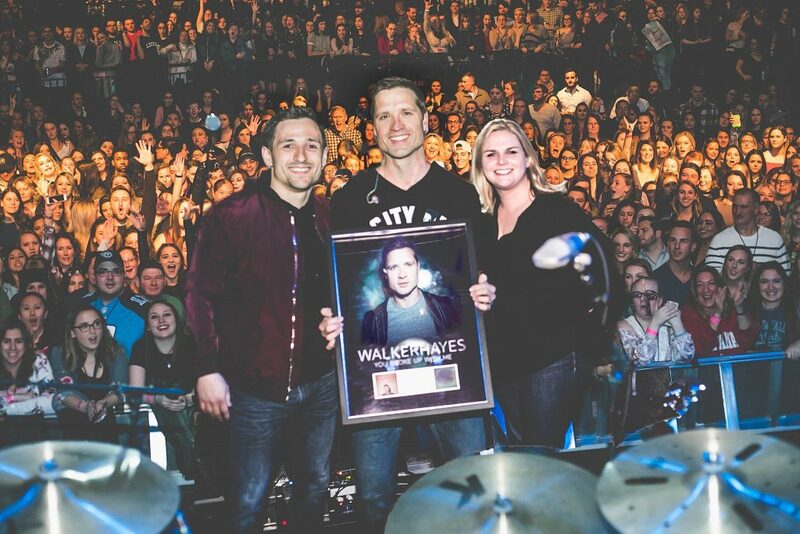 On Thursday (April 5), Monument Records artist Walker Hayes was surprised with Platinum certification for his hit, “You Broke Up With Me,” in front of a sold out crowd of more than 2500 fans at PlayStation Theater as part of Kelsea Ballerini’s Unapologetically Tour. The Platinum certification signifies 1 million records sold. As he was brought to the stage by the local radio station, NASH FM, DJs Katie Neal and Jesse Addy introduced him to the packed house as a “13 year overnight success story” and although the first single from his debut album, “You Broke Up With Me,” is now Certified Platinum, Hayes says the long journey to this point is what makes it so special. The Top 10 hit is followed by “Craig,” written by Hayes in an effort to thank a friend for his generous gift of a car when Hayes’ family was having trouble making ends meet.